Town - Bedford at Bedford TownBedford is the county town and is dominated by the river and its many fine buildings. The town of Bedford began to develop at a river crossing in the middle Saxon period (6th to 7th century). King Edward the Elder, son and successor of Alfred the Great, is known to have come to Bedford in AD 915 when he ordered the digging of the King's Ditch, south of the river, part of which still survives at the Rope Walk/Ampthill Road junction. The Norman Conquest in 1066 led to the building of the castle which was destroyed following a six week long siege in 1224, with only the mound remaining in public gardens near to Castle Lane. Bedford's principal parish church, St. Paul's dates from the 13th century but was rebuilt at least twice in the medieval period, suffering from its close proximity to the castle. St. Peter's Church has some late Saxon work and the medieval St. Mary's Church, redundant since the early 1970s, has been carefully restored to house the County Council's Archaeology Centre, which opened in 1991. St. Cuthbert's Church was rebuilt in neo-Norman style in 1847 and was then described as a 'miniature cathedral'. St. John's Church was originally the chapel of the adjoining St. John's hospital. St. John's House, the former rectory, incorporates the remains of a medieval hospital and is said to be the inspiration for the 'Interpreters House' in Bunyan's 'The Pilgrim's Progress', which Bunyan began to write while imprisoned in Bedford Gaol in 1676. There are several other reminders of John Bunyan in Bedford. The site of the cottage in St. Cuthbert's Street, where he lived, is marked by a plaque and the site of the old County Gaol is marked by an inscription set in the pavement on the corner of High Street and Silver Street. In Mill Street is Bunyan Meeting Church with its magnificent doors, famous stained glass window and the John Bunyan Museum, while Bedford Central Library has a valuable Bunyan collection. Finally, on St. Peter's Green is a larger than life bronze statue of Bunyan set on a stone plinth. Bedford's prosperity dates from the latter 17th century when the River Ouse was made navigable to the sea and the town became an important point for distributing goods up and down the river. During the 18th century a network of turnpike roads radiated out from Bedford and during the first half of the Victorian period the railways arrived in the town. Bedford is an important centre for shopping and commerce and has a wide range of industries with an emphasis on engineering. Business parks and industrial estates include Priory Business Park, Elms Farm, Bedford Heights and Viking Industrial Estates, and at Kempston, Woburn Road Industrial Estate. There are also a number of 'out of town centre' retail developments, notably the Interchange Retail Park and Rope Walk. Major companies based in and around Bedford include: Binney & Smith (Crayola); Charles Wells (brewers); DERA (research centre for MOD); Hanson Brick (brickmaking); Unipath (medical products); Power Innovations (power semi-conductor components); Sainsbury's and Tesco (supermarket retailers); Box Clever (tv and related rental and retail) and Autoglass (vehicle glass) and a range of other manufacturing and distribution businesses. An attractive landscaped riverside walk stretches from one side of the town to the other and many regattas and other events take place on the river which is navigable to the sea at the Wash. The town also has a number of public parks and excellent sporting facilities including the Oasis Leisure Pool, The Robinson Indoor Pool, the Bunyan Sports Centre, an excellent sports stadium, an 18 hole golf course and Bedford Rugby Union Football Club. In the latter half of the 19th century the reorganisation of the Bedford Charity, otherwise known as the Harpur Trust, made available public school education and this attracted large numbers of people to live in the town, many of them retired army officers or colonial civil servants. Bedford is still renowned for educational excellence with long established independent public schools and a variety of nursery, primary and secondary schools. The town has a campus of De Montfort University and Bedford College offers a variety of courses. Bedford Museum in Castle Lane and the nearby Cecil Higgins Art Gallery are well worth a visit. Besides John Bunyan, other famous people associated with Bedford include John Howard, the famous 18th century prison reformer who lived in Bedford and was High Sheriff of the county, and Trevor Huddleston, the Anglican Priest and tireless fighter against apartheid in South Africa who was born in Bedford in 1913. There is a bust of him in Silver Street and a statue of John Howard in St. Paul's Square. Bedford still has a traditional open-air market held on Wednesdays and Saturdays as well as a regular farmers' market. The indoor Harpur Shopping Centre is behind the neo-Tudor castellated facade of the old Bedford Modern School, designed by Blore who also designed the original east front of Buckingham Palace. The old and new Town Halls are in St. Paul's Square as are the Shire Hall law courts. Also close by are the Civic Theatre, Tourist Information Centre and the Corn Exchange (the town's main public hall). The late American bandleader, Major Glenn Miller and his orchestra were stationed in Bedford during the second world war and used to broadcast regularly from the Corn Exchange. In Bromham Road there is a fine late Georgian terrace built in the 1830s and restored for office and residential use in the 1970s. Opposite stands the High School and nearby in The Crescent and Adelaide Square are some fine late Georgian houses. The Swan Hotel, on the corner of the High Street and The Embankment, was built in 1794 and contains a 17th century staircase from Houghton House near Ampthill. The bus station is centrally located while the main railway station is just to the west of the town centre and is on the Midland Mainline from London St. Pancras to Sheffield. The line is electrified to London and the south with direct services to Brighton. There is also a local service to Bletchley. Bedford is the county town and is dominated by the river and its many fine buildings. 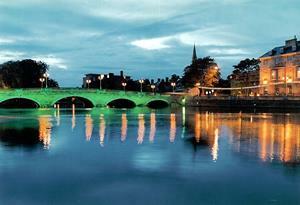 The town of Bedford began to develop at a river crossing in the middle Saxon period (6th to 7th century). King Edward the Elder, son and successor of Alfred the Great, is known to have come to Bedford in AD 915 when he ordered the digging of the King's Ditch, south of the river, part of which still survives at the Rope Walk/Ampthill Road junction. The Norman Conquest in 1066 led to the building of the castle which was destroyed following a six week long siege in 1224, with only the mound remaining in public gardens near to Castle Lane.